The role of new Chairman of Shaftes has been passed on to John Jones. 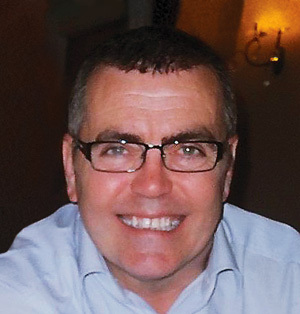 John is a Chartered Legal Executive and Licensed Conveyancer and is currently Compliance Director for Total Conveyancing Services, based in Cheshire. He divides his time between his roles as his firm's senior property & compliance lawyer, lecturing and delivering training to staff. He has written many articles for trade journals as well as a popular series of legal guides for a national magazine. 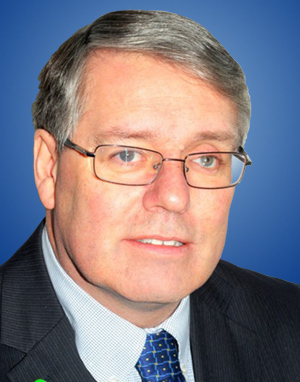 John also sits as a professional member of the governing Council for Licensed Conveyancers, and as a professional member of the Appeals Panel Tribunal for Ilex Professional Standards. 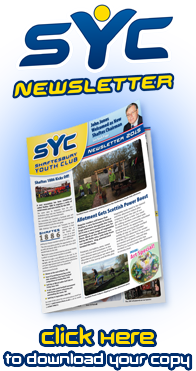 The 1886 Group takes its name from the year Shaftesbury Youth Club (originally a boys’ club) was founded. The Club will be celebrating 130 years of continued existence in 2016. 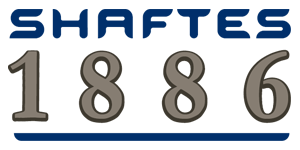 The 1886 group consists of “old” Club members led by Paul Turner a Shaftes Council member, who meet regularly for fundraising, social events and occasional work days. This group is a shining example of our volunteers in action. Recently the group spent a Saturday cleaning and beginning renovations to the Sports Pavilion which will be continued through the summer. In June they organised a Golf Day at Wirral Ladies In Prenton with proceeds to go to the Pavillion renovation fund. Phil Nugent our Club Manager ( pictured below) dusted down his golf clubs, unused for many years and walked away with the trophy for "Best Individual", much to the surprise of his fellow competitors. On August 30th the 1886 group will be hosting the annual Football and Fun tournament at the Club as a memorial to Sean O'Farrell popular youth worker. The proceeds will also go to the Pavillion renovation fund. As we know, these are difficult times for organisations like Shaftes, in our case a charity which depends for funding on generous voluntary donations and money from the ever-more precarious budget of Wirral Council. But our work is vital and we have to plan for hard times as well as good if we are to survive and thrive. So at the end of May Club trustees and staff attended a ‘strategy day’ to thrash out the Club’s strengths and the opportunities available, as well as to examine its weaknesses and to discuss the threats it faces. We needed to know what we can do – and what we can do better – to ensure the Club continues to be the great place it has become in its 130-year history. Everyone worked hard and the energy and enthusiasm displayed were exactly what was required to achieve the purpose of the day. We talked about our vision and our mission. What must we do if Shaftes is to be the Wirral’s most successful youth club and provider of alternative education services? The Club has to be clear about its values and how it goes about achieving its aims. And it must recognize the context it which it operates and how that is changing. A lot was produced by the participants. The output from the day was a much clearer strategy for the future and a comprehensive plan with some very specific business objectives. All of this will be shared with our supporters now that it has received final approval by the Club Council. The LADS Project is a twelve week personal development programme aimed at 13-19 year-old males and was carried out across each of the four Wirral Youth Hubs. A key feature of the project is that different agencies meet and work together to support the young men. The project is concerned with low-level safeguarding and targets those considered likely to benefit. Weekly sessions in the Club include discussing risk-taking behaviours and healthy lifestyles, with practical activities to engage the members. 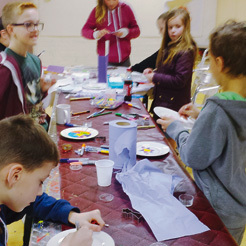 The culmination of the project was a two-night residential event where all the participants came together at the Oaklands outdoor pursuits centre in North Wales. Phil Nugent and Darren Sharrock were the key workers for Shaftes, both having in-depth experience of this challenging area of youth work. One of the drawbacks to such schemes is that attendance is voluntary resulting in low rates of engagement, but those who complete the course can gain a great deal. Two notable successes from the Shaftes group have gone on to become regular attendees at the Club. The project was evaluated as a worthwhile success and could be repeated in the future. 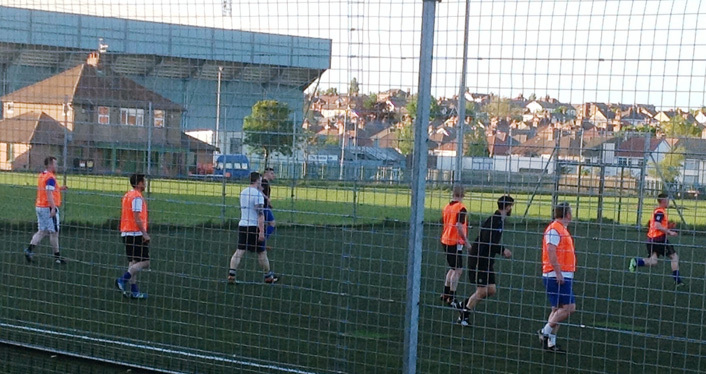 The impressive range of facilities at Shaftes is often a surprise to visitors and youth workers from other clubs. 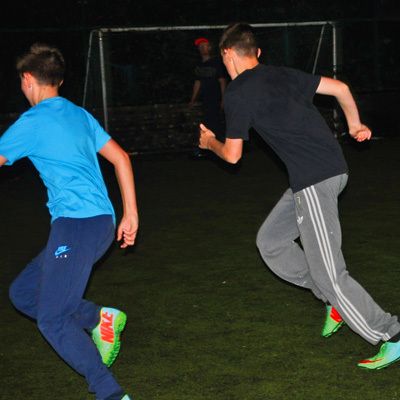 We want to welcome youth club members from across the Wirral and give them the benefit of our extensive facilities. The shortage of qualified staff and transport often prohibits this, but there is still great potential for future development of this area. A new association has been established called Shaftes 1886 to organise a series of social events and raise money for the club. The name takes its inspiration from the year Shaftesbury Boys Club was founded and among the plans are a golf day and memorial match. The association has launched a Facebook page and Twitter account (both ‘Shaftes 1886’) and will encourage former members to join the new group. 1886 chairman Paul Turner said: “Everyone has fond memories of their playing days at the Shaftes and a few of us have been talking about setting up a former members’ group for a while now. “The new association provides the opportunity to catch up with old friends while at the same time raise much needed funds for the club. “We’ve got a series of events lined up and we are hoping to attract as many former members as possible. “We want to make a real difference to the club. So, for example, over the next few months we are planning to carry out improvement work on the pavilion with former members contributing their time voluntarily." 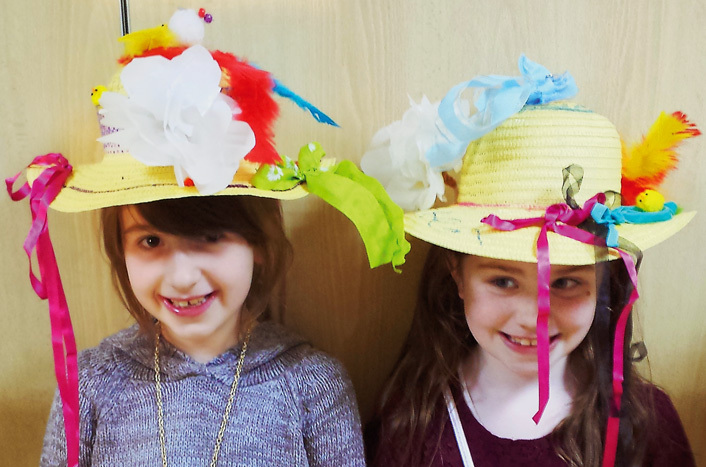 Our Art Club continues to flourish thanks to our great volunteer group leaders, Andrea and Julie. 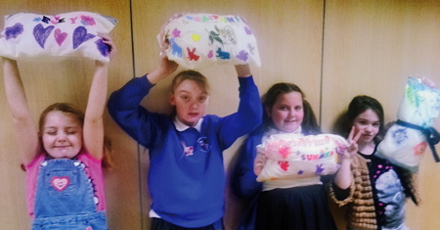 The youngsters were busy recently creating colourful Easter hats, pillows and other fantastic artistic creations. The Club and Shaftes Council owe a big thank you to Ray Linforth, who has stepped down as Chairman. Ray, a retired architect, has been an active and well respected chairman and has steered us through difficult and uncertain times in recent years. He will continue as a council member and we are very grateful for his efforts and we wish him a more restful future. 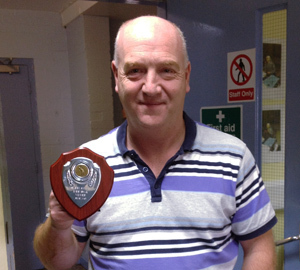 Energetic volunteer Mr Kelly has contributed to numerous activities at Shaftes for many years. 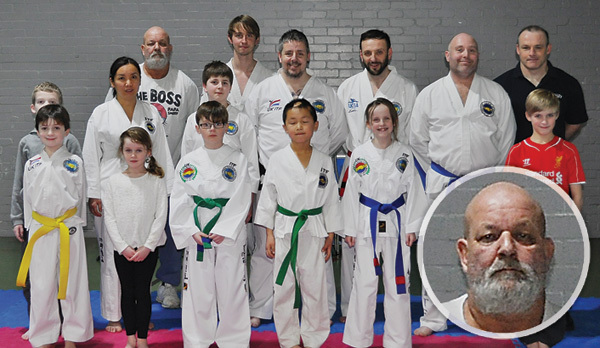 As well as leading and organising the regular Tae Kwon Do Club he has provided invaluable assistance in many more club activities such as working on the allotment. The work of volunteers like Mr Kelly do so much for the young people of Wirral and the life of the Club and we are very grateful for all his efforts! Terrifying Halloween & Christmas Monsters Attack! Halloween just seems to be getting more and more popular. 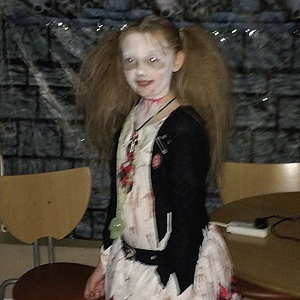 On 29th October a group of brave Club members visited Farmageddon in Ormskirk. The farm barns there are converted into spooky, haunted places full of creepy monsters and walking through them is a fun but scary challenge. We held our own blood-curdling evening two days later on Halloween. 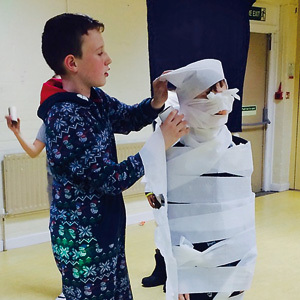 There were lots of creepy costumes... At the Christmas party the most popular game of the evening was the ‘create an Egyptian mummy’ competition. Sean O’Farrell, an extremely popular and active youth worker at Shaftes for 25 years, sadly died as a result of cancer in 2013. A football tournament was set up in his honour involving three teams consisting of other members, ex-members, and our star players Phil Nugent (Club Manager) and Paul Turner (Shaftes Council Member). Phil is pleased to report that his team won, albeit on a penalty shoot-out. £450 was raised by the participants and this will be used to buy a memorial bench in Sean’s name, to be placed in front of the sports pavilion. It is intended that the tournament will become an annual event.